Well, the Brooklyn Paper of 2009 looks like its most recent iterations, in print and online, and it features consistent Kuntzman-esque cleverness. But it has not only retreated from aggressive coverage of the Atlantic Yards issue, it has continued to roll over for the project on the editorial page. So, rather than taking an opportunity to criticize Atlantic Yards supporters for shameful behavior at the May 29 state Senate oversight hearing, the Brooklyn Paper this week urges that the AY arena be built. It's a follow-up from the "brutally weird" editorial the newspaper ran in February, shortly before it was purchased by Rupert Murdoch's News Corporation. And this time, the editorial is not signed by Ed Weintrob, the publisher who wrote the February editorial and is now publisher emeritus. So we can assume it's the corporate view. Convergence with the Courier-Life continues. Bruce Ratner’s bid to save his Atlantic Yards basketball arena by simplifying its design was predictable, but for our part, we’ll stick with consistency: Whatever serious reservations we’ve had about the larger Atlantic Yards project, the plan for the arena — though no longer the grandiose one envisioned by Frank Gehry — still merits support. The state must take back the development rights over the rail yards and put them out for bid. Doing so would not only cleanse state officials of the Original Sin of Atlantic Yards (namely selling Ratner the air rights for $100 million less than their appraised value), but it would also set right Bruce Ratner’s very wrong project. 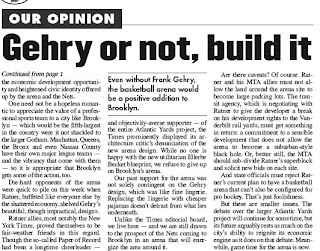 In other words, even if the Brooklyn Paper wants an arena, it's not consistent to support Ratner's plan. The arena remains what we have always said it is: a fundamentally vital civic project in the right place at the right time. Now the timing better fortifies our long-held position. In the current economic climate, it would be foolhardy to walk away from both the economic development opportunity and heightened civic identity offered up by the arena and the Nets. One need not be a hopeless romantic to appreciate the value of a professional sports team to a city like Brooklyn — which would be the fifth-largest in the country were it not shackled to the larger Gotham. Manhattan, Queens, the Bronx and even Nassau County have their own major league teams — and the vibrancy that come with them — so it is appropriate that Brooklyn gets some of the action, too. What is this, 1957? 2003? Doesn't the editorial board read the newspaper's reporting that the economic development opportunity has diminished to the point that the arena would be a loss to the city, according to the Independent Budget Office? Is vibrancy the endless noise at a Nets game? The editorial assumes the Forest CIty Ratner line that the decision was purely economics. And it (!) 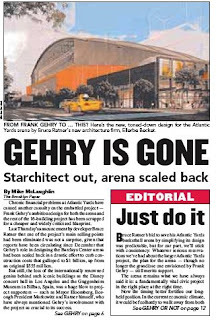 criticizes the New York Times for being "a longtime cheerleader — and objectivity-averse supporter — of the entire Atlantic Yards project," only to "prominently" display "its architecture critic’s denunciation of the new arena design." The editorial allows for a couple of caveats, such as the fear of interim parking lots, a "commitment to a sensible development" to the MTA, and a reconfiguration that allows pro hockey. Shouldn't the MTA get a commitment to fund its capital plan? Also: Or, better still, the MTA should sub-divide Ratner’s superblock and solicit new bids on each site. Except, apparently, for the part of the superblock that contains an arena.